The Bad Cop and DarrylW4 were thrilled to plan their trip to Geowoodstock XII – their third Geowoodstock together! They setup this special page on the GeoGearHeads mini-site to share special content created around the trip. They're now back from that terrific mega-event weekend and have release 18 segments totaling 2 hours and 24 minutes of audio. Check out the posts below (subscribe for updates through RSS if you like) for some special updates and content. If you're not a regular Listener or Viewer, please check out the regular shows! Note: As with most weblogs this lists the most recent release at the top of the list and earliest release at the bottom. We suggest starting with the oldest post and working your way to the top. Next year's Geowoodstock is being held outside Washington D.C. – land of the Virtual Geocaches! 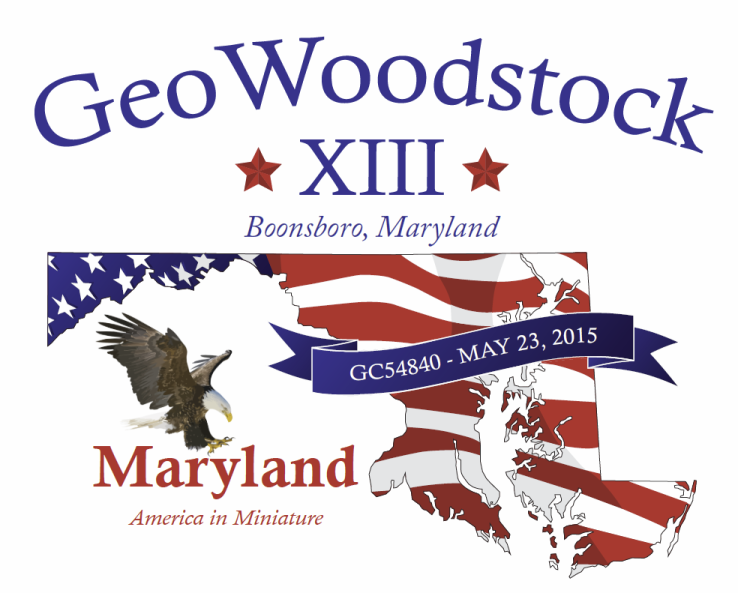 The Maryland GeoWoodstock Committee will be hosting the event May 23, 2015 at the Washington County Agricultural Education Center in Boonsboro. You can start your planning to get that time off but won't be able to register till January. More information is available through the "GC54840" cache page but the full website has not yet been posted. A favorite cache to hit when traveling (especially before and after) are Travel Bug Hotels. There are some issues with them and things to keep in mind. The Bad Cop and DarrylW4 talked about some of those and their opinions in this recording. A cool addition to this year's swag bag was a 512MB thumb drive. On that drive was information about the the event and several GPX files with caches in categories like "11 Icons In A Day," "Grandma Moses Geoart," "Q's Geowoodstock Caches By Major Boothroyd," "Top 20 Favorites," "Top Virtuals," and more. The Bad Cop and DarrylW4 talked a little about the benefits and drawbacks of distributing data like that at an event. During the drive back from Geowoodstock, The Bad Cop and DarrylW4 talked a little about the Lab Caches and decided it was a good conversation to record and share. They had just completed the "Geowoodstock XII Lab Caches" and talked a little about the long term lab caches a the Groundspeak HQ and STEMLandia (which they couldn't remember on-the-spot). There is a list of upcoming events with their own lab caches as well. The Bad Cop stopped at the Wooden Nickel Geocoins' booth to record a little about their products at GW12. Perhaps the most unique booth at GW12 was Sharon Mangan (better known to Geocachers as mamacache) who was selling her coins to raise money in her JDRF 2014 Burlington Ride to Cure Diabetes. The Bad Cop had the chance to talk with her and a gentleman matching all those donations! Some of the smallest objects for sale on GW12's vendor row were available from Travel Fleas. DarrylW4 dragged John Keys from their booth to chat about the products for a couple minutes. One of the booths at this GW12 was mo pirate's "That & That." The Bad Cop took him aside briefly to talk about those coins and tags he'd designed and was selling there on Vendor Row. Though the owners of Space Coast couldn't talk with DarrylW4 about their shop and products, he still managed to get a few minutes with one of their friends helping man the booth at GW12. Among the vendors set-up at GW12 was Red Hat, selling their custom wearables right there, customize onsite! DarrylW4 took a couple minutes to chat with Jen about those products.